Pros: Durable and all the checklists in one spot. Good laminating quality. Review: I never fly without this checklist. It is excellent. Has emergency procedures on the back, and all the "speeds" of the C172 I fly. Really good tool. 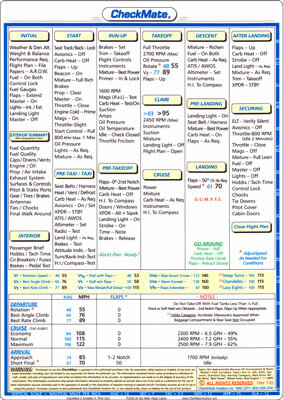 I would not fly without using this checklist. Review: I attach to a lanyard that I wear around my neck making it instantly available for each phase of the flight. Review: Not enough information regarding required speed per check section. Too broad and generic. Review: I attached this to a lanyard that I hang around my neck. It is always available for my use. Cons: information too broad and generic.